Director-choreographer Bob Fosse forever changed the way audiences around the world viewed dance on the stage and in the film industry in the late 20th century. Visionary, intense, and unbelievably driven, Fosse was an artist whose work was always provocative, entertaining, and quite unlike anything ever before seen. His dances were sexual, physically demanding of even the most highly trained dancers, full of joyous humor as well as bleak cynicism — works that addressed the full range of human emotions. Through his films he revolutionized the presentation of dance on screen and paved the way for a whole generation of film and video directors, showing dance through the camera lens as no one had done before, foreshadowing the rise of the MTV-era of music video dance. 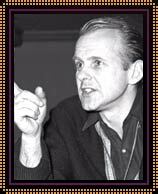 Robert Louis Fosse was born in Chicago, Illinois, on June 23, 1927. Bob was the youngest of six children and quickly learned to win attention from his family through his dancing. It was not long before he was recognized as a child prodigy. His parents sent him to formal lessons, where he immersed himself in tap dancing. A small boy who suffered from nagging health problems, he nevertheless was so dedicated that by the time he reached high school, he was already dancing professionally in area nightclubs as part of their sleazy vaudeville and burlesque shows. The sexually free atmosphere of these clubs and the strippers with whom Fosse was in constant contact made a strong impression on him. Fascinated with vaudeville’s dark humor and teasing sexual tones, he would later develop these themes in his adult work. After high school, Fosse enlisted in the Navy in 1945. Shortly after he arrived at boot camp, V-J day was declared, and World War II officially came to an end. Fosse completed his two-year duty and moved to New York City. For the next seven years, Fosse went through two rocky marriages with dancers Mary Ann Niles and Joan McCracken, all the while performing in variety shows on stage and on television. He had a few minor Broadway chorus parts, but his big break came with his brief appearance in the 1953 MGM movie musical KISS ME, KATE. Fosse caught the immediate attention of two of Broadway’s acknowledged masters: George Abbott and Jerome Robbins. 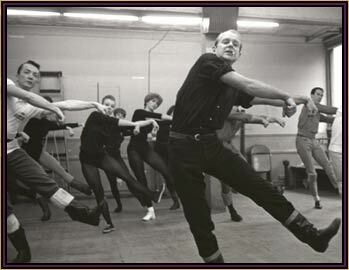 Bob Fosse rehearsing with dancers. His next musical, “Damn Yankees,” brought more awards and established his life-long creative collaboration with Gwen Verdon, who had the starring role. With her inspiration, Fosse created a stream of classic dances. By 1960, Fosse was a nationally known and respected choreographer, married to Verdon (by then a beloved Broadway star) and father to their child Nicole. Yet Fosse struggled with many of his producers and directors, who wished him to tone down or remove the “controversial” parts of his dances. Tired of subverting his artistic vision for the sake of “being proper,” Fosse realized that he needed to be the director as well as the choreographer in order to have control over his dances. His dances were sexual, physically demanding of even the most highly trained dancers. From the late 1960s to the late 1970s, Fosse created a number of ground-breaking stage musicals and films. These works reflected the desire for sexual freedom that was being expressed across America and were huge successes as a result. Before Fosse, dance was always filmed either in a front-facing or overhead view. In his 1969 film version of SWEET CHARITY (Fosse’s 1966 stage version was based on an earlier movie by Italian director Federico Fellini, about a prostitute’s search for love; the film was commissioned by Universal Studios after the success of the stage version) and in later works, Fosse introduced unique perspective shots and jump cuts. These film and editing techniques would become standard practice for music video directors decades later. His 1972 film CABARET was based on Christopher Isherwood’s stories of pre-Weimar Germany. Articles on the film appeared in all the major magazines. Photos appeared on the covers of TIME and NEWSWEEK. The film was Fosse’s biggest public success and won eight Academy Awards. Fosse’s “Pippin” (1972) became the highest earning Broadway show in history, as well as the first Broadway show to advertise on national television. “Pippin” was awarded five Tony Awards for the 1972-73 season, one of them given to Fosse for best direction and choreography. Fosse staged and choreographed a variety show special for NBC starring Liza Minnelli, LIZA WITH A Z, which brought Fosse an Emmy Award and made him the first person to ever win top honors in three entertainment mediums — stage, film, and television. Two stage musicals followed: “Chicago” (1975) and “Dancin'” (1978). During rehearsals for “Chicago,” Fosse suffered a heart attack. He survived and used much of that traumatic experience in 1979 in his semiautobiographical dance film ALL THAT JAZZ. Two other films, LENNY (1974) and STAR 80 (1983), were not the popular successes that his other shows had been. “Big Deal,” Fosse’s last musical, was also poorly received. After a rehearsal for the revival of “Sweet Charity,” Fosse suffered a massive heart attack and died on the way to the hospital. Fosse’s contribution to American entertainment continued after his death via show revivals and dance classes. His most prominent contribution was through the body of his work recorded on film and video. Source: Excerpted from ST. JAMES ENCYCLOPEDIA OF POPULAR CULTURE. 5 VOLS., St. James Press, © 2000 St. James Press. Reprinted by permission of The Gale Group.